Jake the Dog from Adventure Time sings an awesome song about making bacon pancakes. It will drill into your brain…. enjoy! Oh, and thank you to That’s Nerdalicious! for putting up the post about it! You guys are the best when it comes to the perfect combination of nerd, bacon freak, and just anything awesome and fun. 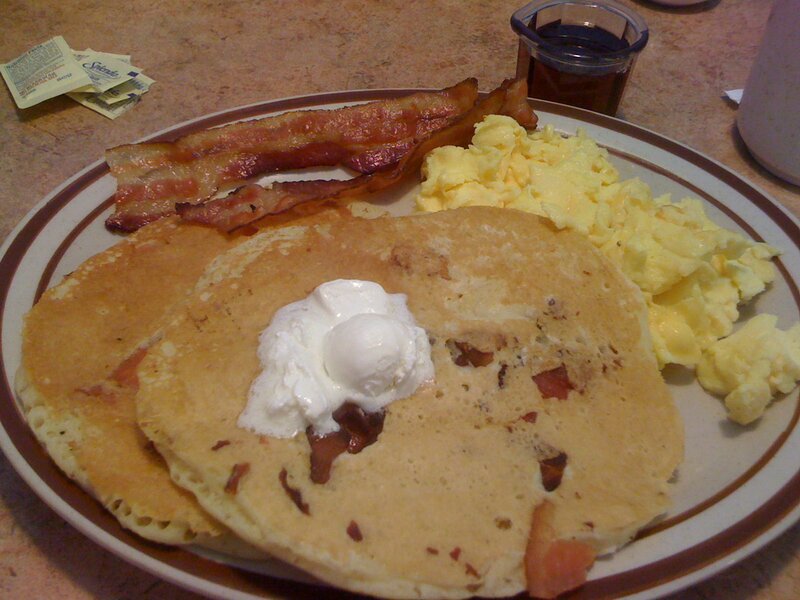 I know it may be old news, but Denny’s is celebrating bacon with “Baconalia“. I can’t seem to find an end date, so any bacon lover out there may want to go at least try it out before it ends. I know. I know. It IS Denny’s and you may leave praying that you had some Imodium in your pocket, but it is bacon. The last few time Ric and I had gone to Denny’s before the Baconalia, our food took forever, something was missing, and/or the food was just ‘eh’. But my mind was set on enjoying some bacon and I could not believe they could possibly mess up bacon. We decided to test out this bacon experience for breakfast back on April 3. Of course we tried some breakfast favorites. I had the Bacon Flapjacks and Ric had the Ultimate Bacon Breakfast. The bacon was kin of rubbery but over all it was good. Just good. And it was ‘good’ because there were no high expectations. They have 5 other choices on the menu: Pepper Bacon & Eggs, Triple Bacon Sampler, Maple Bacon Sundae, BBBLT Sandwich, and Bacon Meatloaf. First of all, I would be afraid to eat meatloaf from Denny’s. And the rest aren’t very creative at all. I know it sounds stupid coming from me because I haven’t tried many ‘creative’ recipes. But if I was a big restaurant chain, I would try to think of better ideas. 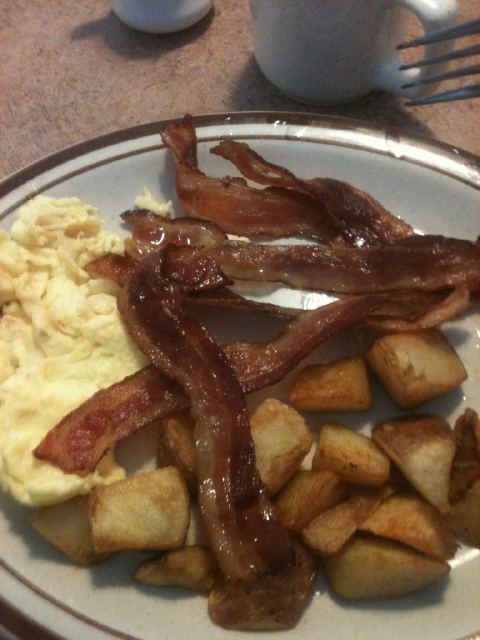 Most of the dishes were just offering two to 4 slices of extra bacon than you would normally get with a breakfast plate. And the sundae just has bacon crumbled on top. Why not MIX in it the ice cream? They do milkshakes so they have the equipment. Their website is actually more intriguing than their food. It talks about the history of Baconalia, offers bacon e-cards, songs about bacon, shows the moves for a bacon dance, and and a bacon cam. It’s a little weird but maybe entertaining to some bacon lovers. Oh, well. The rant is dragging on. If you try it yourself, let me know what you think. For my second year of International Bacon Day (September 4, 2010), I wanted to try new bacon dishes but was still a little lazy in my ideas. 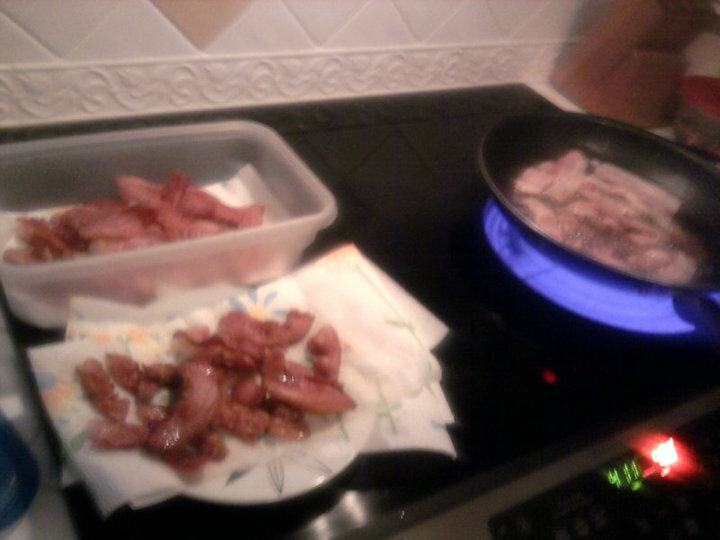 To start with, my choices in bacon were Applewood and Turkey. I’m sure there was a third but I can’t get my mind to remember (greasy fog… ha!). I actually started Bacon Day early this particular year. 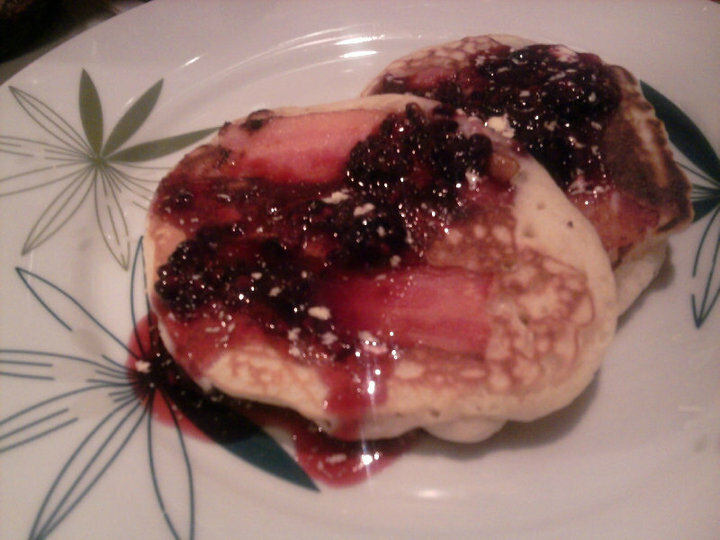 I made Applesauce Bacon Pancakes with Blackberry Butter Syrup Topping late the night before. I couldn’t wait to start Bacon day and wanted to enjoy some bacon with my boyfriend, Ric. I had mentioned Bacon Day to several employees at work and everyone seemed thrilled. So, I got up early, made bacon, and took a tuberware to share with my fellow co-workers that day. The doctor working that day brought bagels and smear. 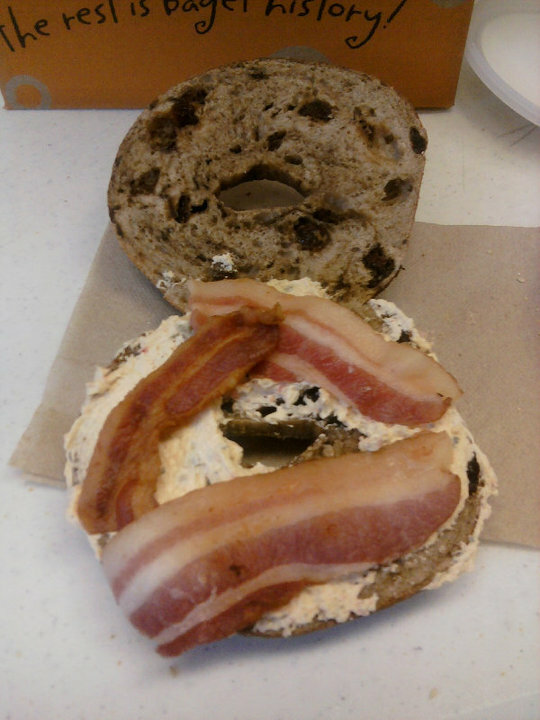 I enjoyed a raisin and cinnamon bagel with garden smear and bacon. When I got home after my Saturday shift, it was about time for lunch. I wanted to have something a little light but knew I needed to include bacon. 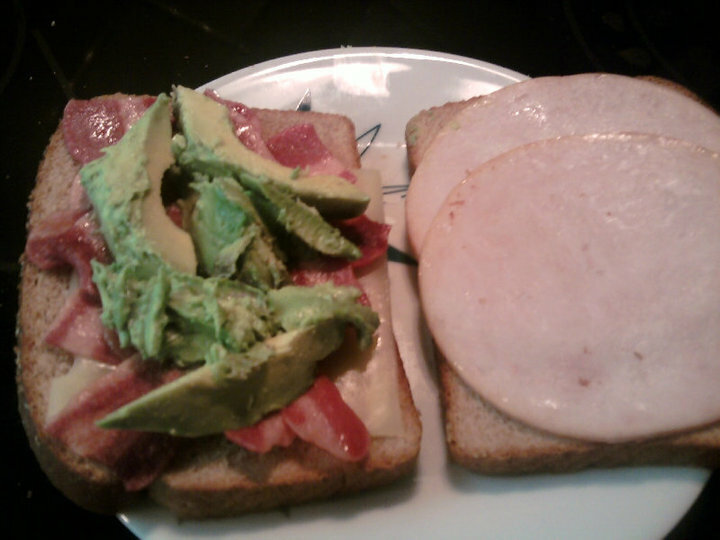 I decided to make an easy sandwich: Turkey Bologna with Swiss Cheese, Avocado and Turkey Bacon on Wheat Bread. As a snack, I wanted to try chocolate covered bacon again. As I mention in 2009 post, I have not been able to get chocolate morsels to melt for me the right way since. I did get the bacon covered but not as well as in 2009. 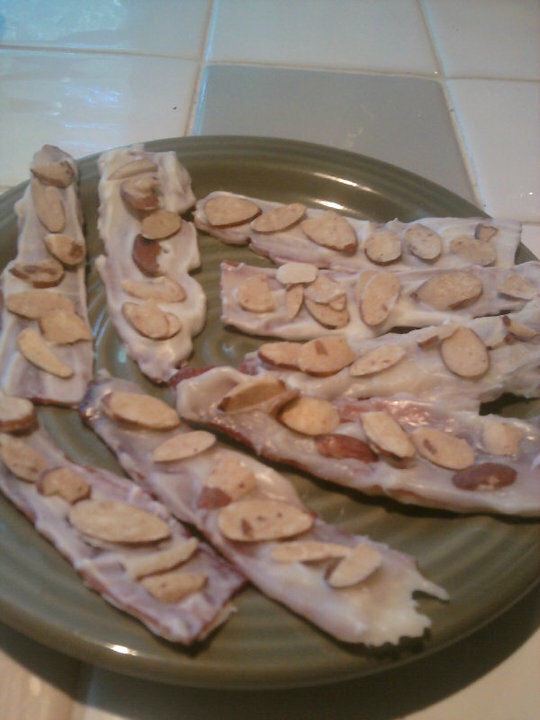 I used white chocolate on turkey bacon and topped the strips with honey roasted almond slices. So far, this is my favorite choice of chocolate covered bacon. 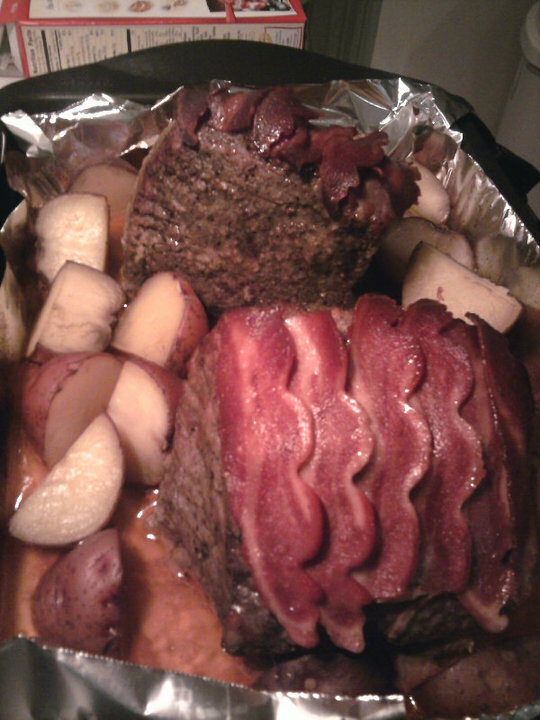 For dinner, Ric and I had a roast sitting out to cook. At this point I really did not know how to include the bacon and just added my seasonings like usual and added bacon on top to bake with it. We included some red potatoes, which didn’t help ‘lighten’ the dinner up. Everything seemed to be sitting pretty heavy by the time dinner was cooked and eaten. But we still had dessert. For dessert, I REALLY wanted to try caramel bacon but did something wrong so it would not hold. I quickly decided I would make this caramel into a topping for an angel food cake I already had the mix for. 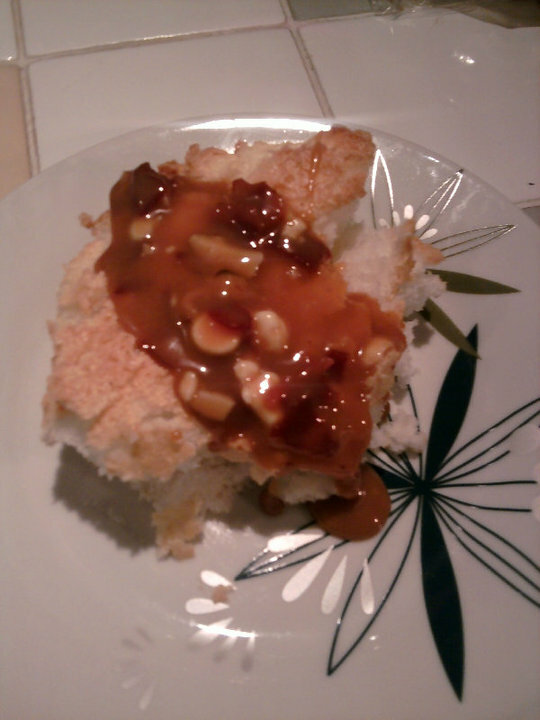 The topping included caramel, crumbled turkey bacon, half melted white chocolate morsels, and almonds. It was so sweet. I may never make this again. It was good but you can only handle a small amount unless you have a major sweet tooth. Once again, I had enjoyed Bacon Day and because I survived it, I considered it successful. I wasn’t as creative as I hoped but maybe next year will be. I’m really interested in finding someway to incorporate beer. I did already request the day off of work (yes, I am aware of the date) because I plan on really making this year an EVENT.